I grew up in Cologne, Germany, that is Köln. 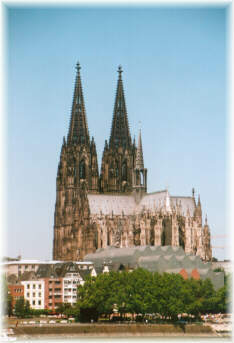 Cologne was founded 50 BC, as a colony of Caesar. It is the fourth-biggest city in Germany with 1 mio people living there. I went to the University of Cologne (Universität zu Köln). I was there between October 1990 and September 1997, receiving a Diplom in Physics (which is an equivalent of a masters degree). Between July 1995 and December 1997 I worked for the Computing Center, taking care of the program TeX. So, while I was in Cologne, I grew up there, went to school, learned about Gestalt therapy, studied physics, and learned about Unix and TeX.